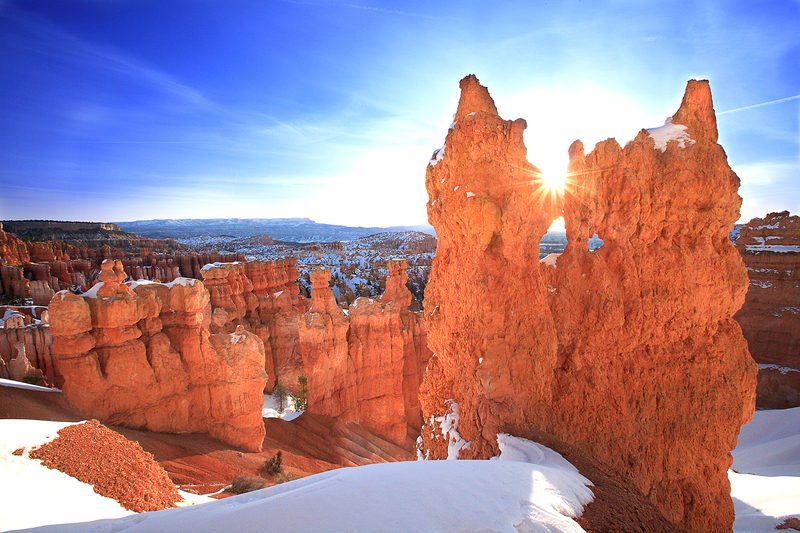 A Paiute Indian myth says “the animal legend people who lived in Bryce Canyon long ago, displeased the coyote. Angered, he turned all the people to rock.” When you visit Bryce Canyon, think of the legend when looking down into the amphitheaters and it’s not hard to imagine the ancient people with their straight posture, in the form of hoodoos. This a land of delicately carved rock spires in sunset shades, Bryce Canyon National Park in Utah in the USA has an out of this world landscape. If you look off in the distance you can see our beautiful little town of Tropic, Utah. Remember that Bryce Country Cabins is the place to stay while you explore Bryce Canyon and the surrounding area. Bryce Canyon from Chad Richard on Vimeo. Bryce Canyon is another spectacular example of erosion of breathtaking beauty. 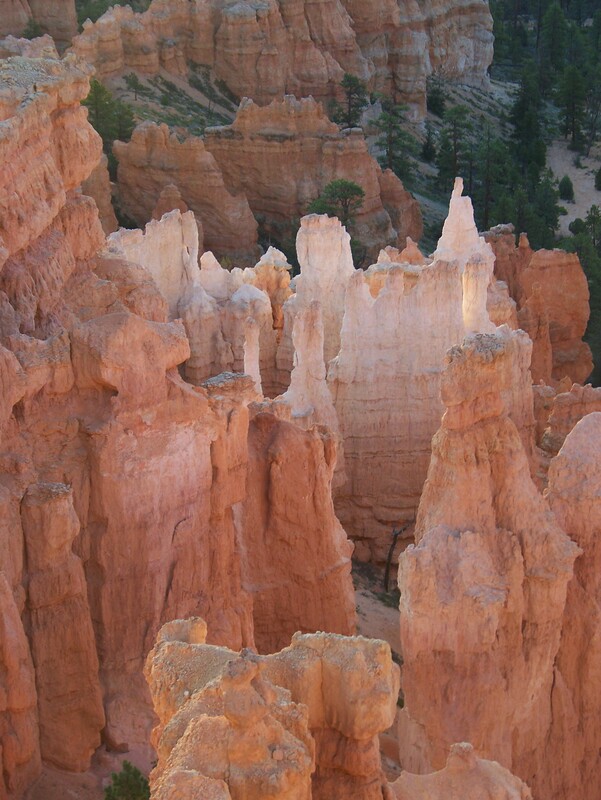 Bryce Canyon National Park’s wilderness of phantom-like rock spires attracts more than a million visitors each year. Interesting fact: Water, ice, and gravity are the natural forces that formed the geological “hoodoos”. Bryce Canyon is a collection of humongous natural amphitheaters. In fact, the canyon is named after the Mormon pioneer Ebenezer Bryce, the Scottish homesteader. Bryce Canyon became a national park in 1928. Most park visitors sightsee using the scenic drive, which provides access to 13 viewpoints over the amphitheaters. At dawn and dusk, mule deer and antelope graze the forested plateau along the road. It’s just about that time. The 2016 tourist season is upon us. Watch this video and we know you will get excited to come out and see the wonder and the beauty that is Bryce Canyon. When you are here, ask us some of our favorite spots in the park and around Tropic. We look forward to seeing you soon. We came across this image and honestly we were blown away. This beautiful photo by Javier de la Torre does the canyon justice. What do you think? Camping in Bryce Canyon in the winter is becoming more and more popular. Believe it or not there are a lot of things to do here in the winter. The obvious are cross country skiing, snowshoeing, snowmobiling and photography. The north and Sunset Campground in the National Park are open during winter months. The showers and laundry are not available nor is the dump station for RVs during the winter. There are horse drawn sleigh rides, ice skating in Bryce Canyon City. There is even a Winter Festival held at Ruby’s Inn. Click here for more info. Fairyland Road and the Paria Point Roads are intentionally left unplowed in winter so as to provide a skiable/snowshoeable surface when snowpack is minimal. After winter storms, the road to the southern and higher elevation overlooks, may be closed for several hours or even overnight while snowplows work to reopen that half of the park. However, the roads and parking lots which provide access to the four most scenic overlooks (Bryce, Inspiration, Sunset and Sunrise Points) are plowed immediately after winter storms. Snow is ONLY cleared from the sidewalks at the overlooks plus the paved trail from Sunset to Sunrise Point. Therefore, all hiking trails are CLOSED TO THOSE WHO wear tennis shoes, dress shoes, etc. Waterproof hiking boots or snow boots are essential if you plan to hike. Additional traction devices (see below) are necessary to traverse the most popular trails. Bryce Canyon is a photographer’s paradise. It is so beautiful that it can be difficult to decide where to take a picture. Bryce looks different depending on time of day, time of year, cloud cover, snow cover and your mood. 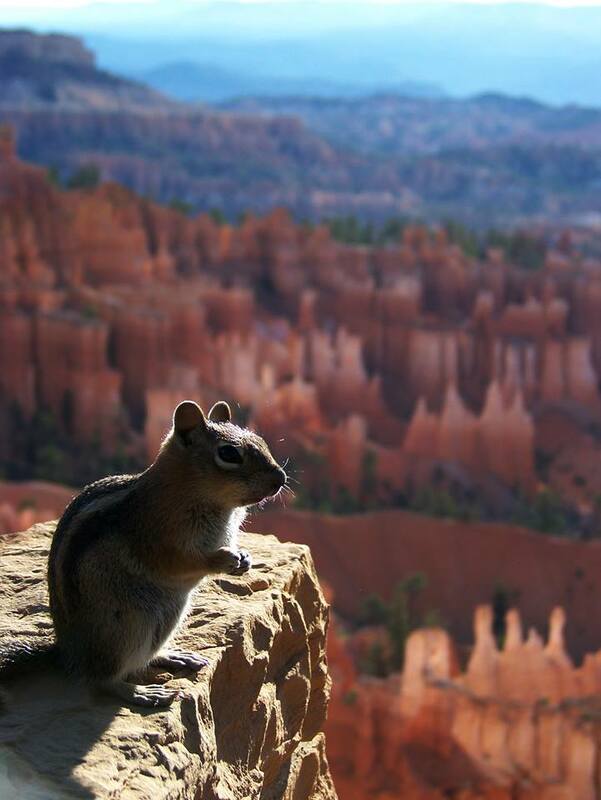 Declared a National Park in 1924, Bryce Canyon is best known for its hoodoos. About one hour before sunrise until two hours after sunrise is the best time to take photographs at Bryce Canyon. Just before sundown is also a great time to take photos in Bryce. The low light really brings out the colors in the rock formations. About two hours before sunset, the light on the features to the east in the Dixie National Forest and the Grand Staircase Escalante National Monument can be awesome. Great telephoto shots of Table Cliffs and Navajo Mountain are waiting for you. The night before a full moon can be great for pictures of the moon against a beautiful horizon. Taking pictures at the viewpoints with guardrails can be a bit of a challenge if you are using a tripod. This area of the Colorado Plateau at one time was a great basin. Although water could flow in there were no rivers to carry the water out. Instead, sediment formed at the bottom of the lake kept building up. The orange colors are from iron that was carried in and deposited into the limestone layers. Eventually the Colorado Plateau began to rise. So as the land rose, the water drained out and what was once the bottom of a lake became a Plateau. The beauty of Bryce Canyon is actually born from the destruction of this limestone. Erosion in the form of water, wind, but mainly ice (frost wedges) are what have formed the famous Hoodoos. The upcoming Winter Festival in Bryce Canyon City is going to be delightful. The winter tradition takes place over President’s Day weekend and allows participants the rare opportunity of visiting a snow-capped Bryce Canyon. The towering red rock spires and contrasting white snow combine to create stunning scenery in the giant natural amphitheater. 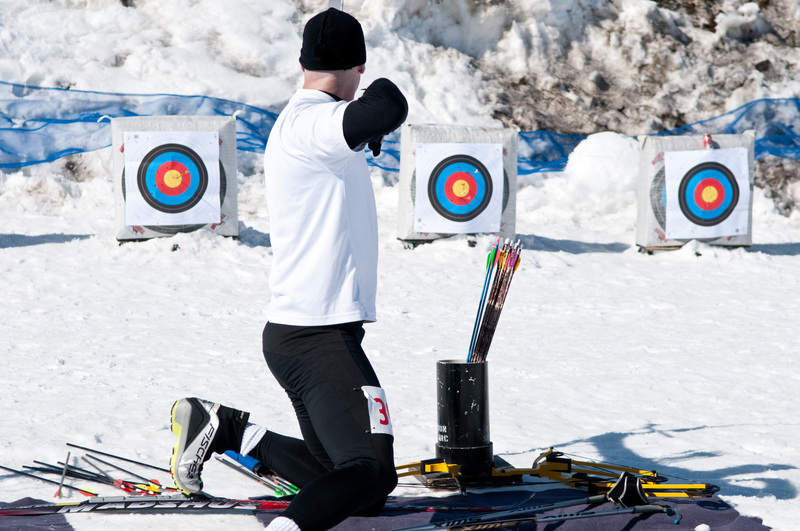 The ski races are just the beginning of the family-friendly activities happening both indoors and outdoors. The schedule includes kayaking tutorials, running clinics, dance classes, leather working, watercolor painting and photography. This year the National Park Service is waiving the $25 per-car entry fee over the entire weekend into Bryce Canyon National Park. This will allow winter festival attendees to take part in ranger-led geology talks, snowshoe hikes, astronomy presentations and telescope viewings. Bryce Canyon is the ultimate place to learn about and enjoy the splendor of the night sky. Bryce Canyon is the last grand sanctuary of natural darkness. Far from the light pollution of civilization. Bryce Canyon National Park also benefits by being a high elevation park. The annual astronomy festival will be held next year June 1-thru the 4th, 2016. For more info click here. At Bryce Canyon starlight spills out above the unique red rock formations called hoodoos. Here the sky is a piece of the park that is defended as fiercely as it’s fragile rock formations. Bryce Canyon’s astronomy program is thought to be the longest active astronomy program in the National Park Service. It began in 1969 when the Chief of Interpretation and Visitor Services added a night sky interpretation program to Bryce Canyon’s assortment of visitor offerings. Since its inception, there have been many seasonal and full time interpretive rangers who contributed to the growth of the night sky program with educational lectures, constellation tours, and stargazing. By 2001, Bryce Canyon’s skies had become so well known that the park began hosting an annual astronomy festival. By 2007, a team of 15 volunteers and 4 rangers ran the astronomy program from April to October. Although the rangers form the backbone of the program, it could not have reached its current success without the hard work of many volunteers.